These small but mighty ranch seasoning mix and dips mix packets let you add big flavor into any dish, whether you're making a main, side or dip. 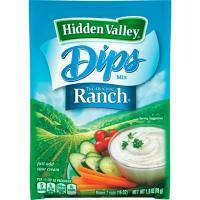 Hidden Valley is the ONLY salad dressing my family will eat! And we use it on more than just salads. The unique flavor cannot be matched! !